Wheels suffer most in terms of the amount of bonded contaminants they encounter. 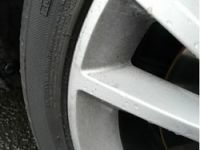 They are not only closest to the road debris, but the brake dust which will constantly surround them is hot, so more likely to stick to the alloy surface. Brake dust is also metallic, so will corrode and expand, distorting and damaging the alloy surface. Wheel cleaning is the ideal first step in washing your car, but can be a separate process as described below. Using a specially formulated wheel cleaner and wheel brush or mitt, clean the wheel working from the inside out. We especially like the Dodo Juice 'Captain Crevice' microfibre mitt for cleaning wheels, as it allows you to get to all the fiddly bits and is softer and gentler than a brush. As wheel cleaners are powerful abrasives, you don't want to leave them on your wheels for too long, and it's important to make sure all the cleaner is washed off. Give the wheels a good rinse, ideally using a hose or pressure washer. 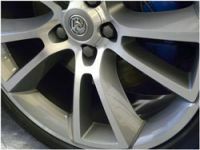 It is worth hosing out your wheel arches, removing the grit and dirt that could otherwise fall back onto your nice clean wheels. Once all of the wheel cleaner has been rinsed off, wash your wheel in warm soapy water. Mix up a bucket of soapy water using twice the recommended strength of your car shampoo. Rinse the wheel, and dry with a microfibre towel. Wheels can be finished with a light wax, or Chemical Guys EZ Creme Glaze with Acrylic Shine or Wheel Guard, which help remove any remaining imperfections and leave a protective, high gloss finish. The rubber compounds used deteriorate and dry out over time, and applying a good quality tyre gel or spray will actually nourish and extend the life of the tyre, as well as making it look shiny and well cared for. It's best to apply tyre gels to clean dry wheels, using old cloths. We particularly like Chemical Guys New Look Trim Gel, works on tyres and trim non greasy, long lasting and incredible shine.